Reminder: only your primary (1st) piece of audio in your post will be sent to your podcast URL. When adding podcast links from Core Publisher for NPR One, we recommend using your program podcast links instead of your standard topic and category podcast links, because program posts have a recognizable identity in a way that your standard topic and category podcast links don’t. It is likely you will want to enter pieces from topic and category pages as segmented content, not podcasts. Using your program page allows you to customize ways for people to connect with your podcast. Under the Podcasts & RSS tab you also can customize your podcast title, description and artwork for external players. For your category/topic/tag content, you should use the "Send to NPR One" flag on the individual posts. This will add your content into the local segmented audio bucket, which typically includes short audio pieces. 2) Locate the podcast area on the right hand side of the screen. 3) Click the "Add New" button. 4) Enter the podcast "Title". 6) Enter your podcast "Description:". 7) Copy the Podcast RSS feed from CorePublisher under the 'Podcasts & RSS' tab of your podcast program page. Be sure use the URL that has /podcasts/ in it. Paste the full "Podcast RSS Feed" url including http:// into the StationConnect ' Podcast RSS Feed: ' field. Please ensure that your Podcast RSS feed contains your logo and iTunes Category. 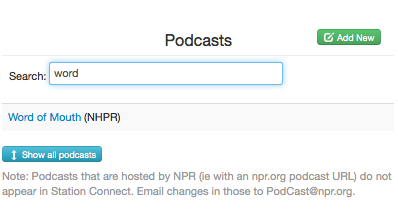 NPR One and the NPR Podcast Directory will retrieve your podcast logo and iTunes Category directly from your RSS feed. 8) Next navigate to the "Station" drop down menu and select the station you would like associated with this podcast. 3) You'll see a "Search:" field, enter your podcast title. 4) Click on the appropriate title when it appears. 5) Make any necessary changes. 6) Scroll to the bottom and select "Save changes" or "Delete podcast."